The “Letter head” action in the Switchboard is based on the Overlay Action which is also available. To select a PDF to overlay, first click on the icon in the bottom-left corner and select “Manage letter head templates”. This will open the folder containing the example letter heads. Copy the desired PDF into this directory. As the list may not be immediately updated, click on the arrow at the top of the window to go back, then reopen the Letter head Action. 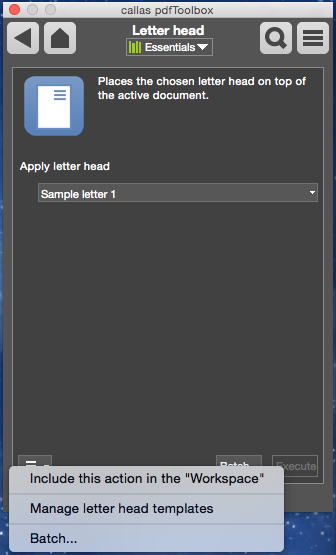 You can then select the letter head.